New tray, from Eva Solo, a must-have at your table! Reduced in design, maximized in its function. This tray is perfect for its purpose, with a high edge and good handle holes, you are always in full control when serving. Moreover, the inside is rubber-coated, prevents glasses and tableware from sliding when you move the tray around. 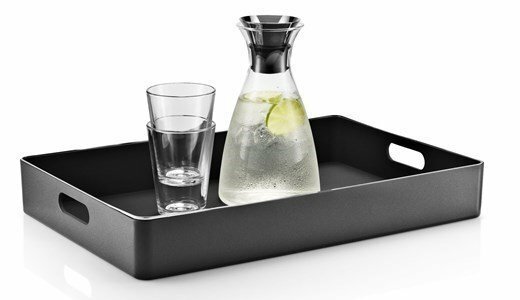 The tray is not only practical, its design is minimalistic and exclusive. It thus adds a decorative touch to any table, and is an item which you will not feel the need to put it away in a hurry. The tray is made of plastic with a narrow, stainless steel edge.